Bali stone pots, vases and planters from Bali Indonesia. Carved stone planters in various sizes and shapes for your tropical Balinese style garden. We use many kind of stones to make these Bali style garden stone pots such as lava stone, river stone and stone from Lombok. We also use green stone and limestone. Handcarved with flowers and floral motifs to decorate your garden or patio. 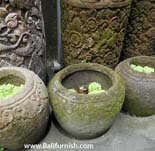 We have various styles of bali stone pots. But if you don't see what you need on our web site, please email us. We'll make the stone pots for you. Please tell us the kind of stone, sizes and the carvings.